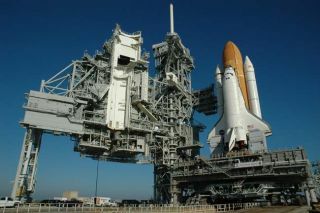 The space shuttle Discovery is settled on its Launch Pad 39B for launch of mission STS-116. Work crews hauled the orbiter and its launch stack to Pad 39B on Nov. 9, 2006 for a Dec. 7 launch. CAPECANAVERAL, Fla - For the first time in more than four years, a NASA space shuttle Discovery ispoised to light up the night sky in an evening launchbound for the InternationalSpace Station (ISS). But weather may intervene. "I'mlooking forward to a really spectacular launch coming up," NASA shuttle programmanager Wayne Hale said of today's planned space shot. "I think we're all readyto resume night launches." Only poorweather threatens Discovery's planned liftoff, with forecasts predicting just a40 percent chance of favorable launch conditions. Low clouds and local rainshowers are top concerns, shuttle weather officials have said. Discovery'slaunch window stretches through Dec. 17, though Friday and Saturday space shotsalso suffer from dismalweather outlooks. Set to rideinto space with Polansky today are: Discovery shuttle pilot WilliamOefelein and mission specialists RobertCurbeam, NicholasPatrick, JoanHigginbotham, SunitaWilliams and European Space Agency (ESA) astronaut ChristerFuglesang, Sweden's first spaceflyer to bound for orbit. With exceptions ofPolansky and Curbeam, all five STS-116 astronauts are making their spaceflightdebut today. "We'recertainly going to go into the thing very optimistic," Polansky told reportersduring training. "We expect that everything is going to work just asadvertised." Discovery'sSTS-116 launch will mark NASA's fourth shuttle flight since the 2003 Columbia accident and thefirst to lift off in darkness since late 2002. Shuttleflight controllers are relying radar installations to monitor the spacecraft'sascent. More than 100 cameras will watch the launch, their view illuminated byDiscovery's twin solid rocket boosters, NASA officials said. Discovery'sSTS-116 astronauts are hauling the $11-million Port 5 (P5)spacer segment to the ISS and will install it to the station's portsideedge during the first of three spacewalks planned for their 12-daymission. Two other spacewalksare dedicated to rewiring the space station's power system into its permanentconfiguration and the activation of the $100 billion orbital laboratory'sprimary cooling system. Some tasks hinge on the successful retraction of asolar panel--something never before attempted in the station's six years ofhuman occupation--which will allow newportside solar arrays to rotate and track the Sun. "I don'tthink we've ever had a flight where we've done so much reconfiguration of theISS all at once," NASA's ISS program manager Michael Suffredini said this week. "We're going to do the largest power down of the space station on this flight." The STS-116mission also includes the rotationof one crewmember aboard the ISS. Williams, a spacewalker and mission specialist,will relieve ESA astronaut ThomasReiter as an Expedition 14 flight engineer. She'll join ISScommander MichaelLopez-Alegria and flight engineer MikhailTyurin aboard the station. "Thomas[Reiter] is ready to return, although in talking to him last week, it soundedas if he would stay a little bit longer if we asked him to," Suffredini said,adding that Reiter has lived aboard the ISS since July. "The team is ready togo and the vehicle is ready to accept the shuttle crew." NASA's lastthree shuttle launches--two returnto flight tests and one ISSconstruction mission--each launched in daylight to give ground and air-basedobservers a clear view of the orbiter's external fuel tank safety modifications. No lessthan 107 visible and infrared cameras, three launch radar systems are in placeto track fuel tank foam debris--or other debris for all NASA shuttle launchesfollowing the 2003 Columbiaaccident. Launch controllers added an additional radar system--literally forthe birds--to scan for pesky vultures or other avian visitors flying along ashuttle's launch path. Shuttleofficials are confident that illumination from Discovery's rocket boosters willgenerate enough light to record the shuttle's launch by camera based onnighttime tests conducted last month. ""We had amarvelous night firing of a solid rocket motor," Hale said. "We proved thatsome of the cameras on board the vehicle will get some data for us." Discovery'screw, meanwhile, is eager to fly. "It's timefor a night launch," Patrick said. NASAwill broadcast Discovery's launch countdown and planned liftoff on NASATV beginning at about 3:30 p.m. EDT (2030 GMT). You are invited to followthe countdown's progress using SPACE.com's feed, which is available by clickinghere. SPACE.com staffwriter Tariq Malik contributed to this story from New York City.